Remember how at one point Amazon encouraged its customers to showroom their local stores and then buy from Amazon.com? Many retailers were upset about that stunt, and now a developer has turned the tables on the retail giant. Actualitte has reported on a new plugin called the Amazon Killer which gives book buyers in France a new opportunity to browse for books on Amazon.fr and then buy the books in a bookstore. The plugin takes the ISBN for the book a user is looking at and searches the Place des libraires website for a local French bookstore which has the title on the shelf. If the ISBN corresponds to a locally available book then users will be prompted with a second buy button which will lead them to Place des libraires. This is a cooperative search engine that can search the catalogs of 460 bookstores in France, and it boasts 1.1 million print and digital titles listed. Not having an account with Amazon.fr and not speaking French, I haven't had a chance to use this myself. But the demo video makes it look pretty simple. The plugin is available for Firefox and Chrome. It currently only works with French bookstores, but the developer is working to expand support to include the UK and other European countries. I'd like to see a similar plugin for the US, but I'm not sure where it would send you. The best options for a search engine which could help you find other booksellers also belong to Amazon (AbeBooks, BookFinder). But I have found them to be relatively unbiased, so perhaps they will serve this purpose. You know who is really going to resent this? Anything that supports Amazon’s role as the first stop in online shopping is going to undercut them a lot more than any sales Amazon might *theoretically* lose. Theoretically, because once consumers see Amazon pricing (and customer service) there is only so much more they will pay for the privilege to “stick it to the ‘Zon”. This reminds me of WABI and WINE 20 years back. It will make a handful of zealots happy but Amazon won’t notice the impact enough to even scratch. Except this is currently in France, where Amazon’s prices are about the same as everyone else’s due to the Lang Law. So you’re both “sticking it to the ‘Zon” and paying the same amount. Win win for everyone. You folks keep acting as if books is all Amazon is about. Books aren’t even that important to Amazon at all. Especially outside the US. If nothing else, all the attention on their book business keeps the attention off their real businesses. This plugin is specifically about comparing book prices. So yeah, I would say that, at least in terms of this article, book prices are the primary topic, regardless of what division loses Bezos the least amount of money. Actually, the plugin CAN’T be about comparing book prices, since differing book prices are forbidden (at any given time, fluctuations are allowed, but consistenly over all retailers). The plugin is comparing “Amazon” against “Physical bookstores”. It’s more some kind of “reverse showrooming” : use Amazon as a showroom and buy where you find it more ethical/equitable/comfortable . Off-topic but more interesting IMO, If books are not the Zon’s main concern, then how does KU factor in, and the reported loss of author’s revenue? Is it true that Zon is attempting to use books as a loss leader, and getting authors to pay for it? Books aren’t a loss leader but they are a self-funding traffic generator. Get people onto the website to look at books, sell them other, bigger ticket items. Plenty of other retailers do the same thing; use low-margin hooks to simply get people in their store. Weekly sales are one approach. Selling movies and CDs at electronics stores another; not much money in selling CDs or DVDs compared to TVs and stereos but those tuesday releases bring people into the store and once they’re there, they’ll see the wares and might buy. It’s early to judge the results. A lot of panicky handwringing with little data. As Nate pointed out, correlation does not necessarily imply causation. The whole effort is just a futile gesture so a few zealots can feel good about themselves because the people it appeals to would never buy from Amazon anyway. They can now not-buy from Amazon by doing their searches on Amazon (generating ad income and market research data for big bad bezos) instead of not-buying through Google. Big.Frakking.Deal. I don’t think so. It’s more not-buying from Amazon while still doing their searches on Amazon instead of going to a few booksellers before finding the one that has the books you’re looking for. So they go to the trouble of coding an app, to serve people who have no interest in shopping at Amazon but who will go and help Amazon make money off their search? You do understand that just by using their database you make money for Amazon, right? That’s why they offer up the APIs developers can use to search their system. Look it up to see how these kinds of emotion-driven efforts simply help further the dominance of the targetted company. They marginalize the competition by making Amazon (or Microsoft, in the WABI case) indispensable. The rational move would be for the B&M vendors to put their catalog online, maybe through a common front end, like the US used-book vendors did ages ago. Of cook up a deal with deal with Google or Rakuten like many onlije vendors have done. Giving Amazon extra publicity and power? That is silly and only somebody blind to the ways of tech and online competition would try. As I said, this app hurts Google’s own shopping search business and even helps Amazon. The “lost” sales were never theirs to start with. So if you don’t like Amazon’s dominance of the market, you’re a zealot? Sheesh. Take a chill-pill. 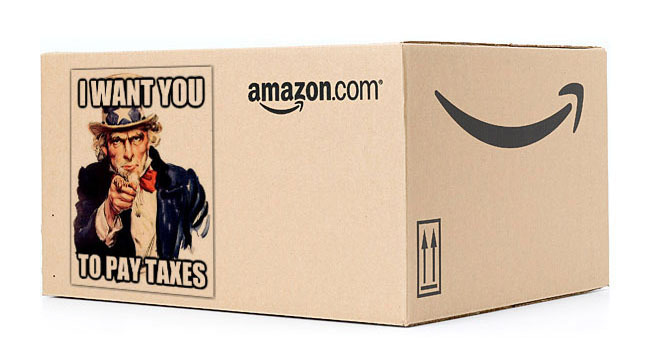 Look, if you don’t want to deal with Amazon, then don’t. But don’t give them *free* data on what books you like and don’t like. That is money in the bank for them. Only somebody with an axe to grind misses something that obvious. If Amazon offers up their data base for trolling it is because they monitor the trolling and profit from it. Alternatives to Amazon do exist. Use them, give them an incentive to do better. Don’t blindly help Amazon steamroller them by boosting their network effects power. In fact, abebooks worked so well, Amazon bought them out. Yep. As I mentioned in the post, AbeBooks would make a good tool for building the US version of this plugin – if not for the fact it is owned by Amazon.